Pokemon Go may be the closest we ever come to living out the fantasy of being actual Pokemon trainers, but it's still missing what one might consider a vital element: throwing a pokeball. A new Kickstarter project wants to change that, and with 37 days left in its campaign, it's already secured its $25,000 goal, plus $6,000 extra. Simply referred to as "the trainer ball," the device has three primary functions. It can be thrown, and by using technology similar to SnapChat's face detection, your phone can detect its location. Land near the Pokemon you see on your screen and the game registers as a hit. There's also an accelerometer function, so you can simply motion like you're going to toss the ball, but actually keep it held in your hand. 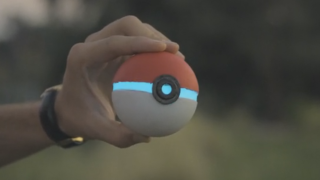 Lastly, it holds a small power bank so the ball can help charge your phone. Seems like a great peripheral, right? Well, before you go and give $45-$55 to secure one of these things, you might want to take note of the risks section (written in all caps no less): "WE HAVE NOT YET FINISHED OUR LICENSING AGREEMENT. IN ORDER FOR THIS PRODUCT TO GO TO MARKET, WE WILL NEED TO FINISH AN AGREEMENT WITH A LICENSED PARTY OF THE APPLICATION." That means that all of this, like every Kickstarter, is theoretical. The group, GamerReality LLC, seems to have a functioning prototype, but it's asking for money before an agreement has been reached with Pokemon Go developer Niantic and/or Nintendo. One would think that should be the first thing you do in a situation like this. I suppose the idea of the campaign could be to prove interest, but it's still a risky proposition. As for what happens to your money should Niantic and/or Nintendo decline the licensing agreement (which, I'm just gonna be 100% honest here, I think they will), GamerReality has said that backers will be offered the choice between a refund minus processing fees or a non-Pokemon-themed kinetic controller for use with other games yet to be developed. In the end, what you do with your money is your business and I'm not saying you should or shouldn't back the project. I personally would love to be proven wrong and see such a device come to market, but I'm not going to wager $55 on that bet. That's just me though - you do you, and good luck catching 'em all, even if it is just by swiping your finger on a screen.